Three Little Beavers introduces us to three siblings: Bevan, "an expert with twigs and mud;" Beverly, "perfect (at) underwater somersaults;" and Beatrix, the one that doesn't quite do anything right. One evening, Beatrix goes in search of her strength and thanks to a sticky situation, proves her worth. Sylvan Dell Publishing is known for their motto, "Science and Math through Literature;" however, author Jean Heilprin Diehl takes the motto further to include a theme so important for a child's social-emotional intelligence. Three Little Beavers highlights differences and the strengths found within them. Combine this lesson with the fun facts about nature's architects, and you have a winner on multiple levels. Can you name other books that touch on a multitude of lessons for children? 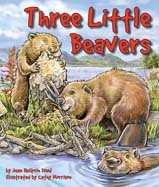 Thank you to Sylvan Dell Publishing for a review copy of Three Little Beavers by Jean Heilprin Diehl. Be sure to also check out the additional online activities associated with this story. If my daughter were about six years younger, she would love Sylvan's books.